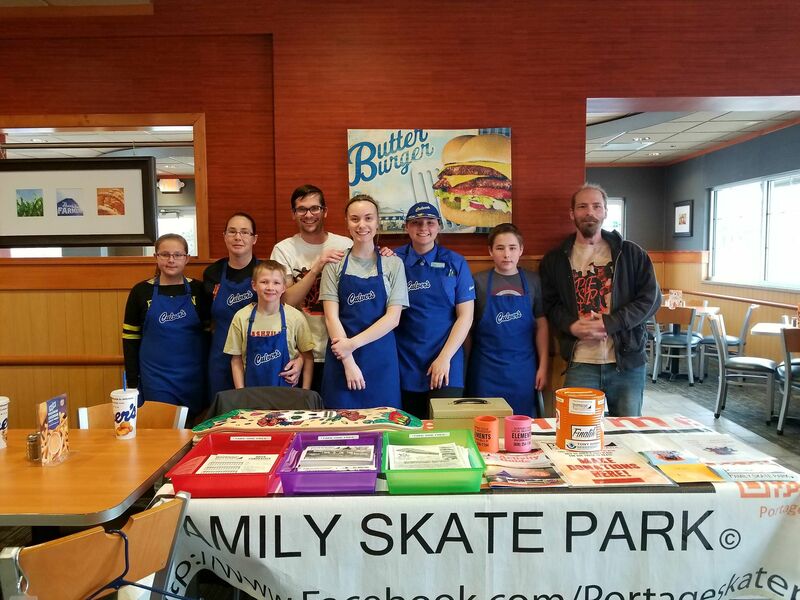 Culvers cares PFSP, was the event that took place on 3/26/2018 from 5pm to 8pm. One thing that occurred during this event, was the giving of information about the Portage Family Skate Park Project. A group of volunteers and I had set up a table in the middle of Culvers. On this table was information about the PFSP, t-shirts, car stickers, Culvers calendars, and much more. All the items on the table were for sale, except the information; that of course was free and was given out with a smile. In addition to that we helped out the workers in Culvers. The group of volunteers split up and went into different jobs. They were taught how to properly wash there hands and had the privilege of wearing a Culvers apron. Four of the volunteers ran tables. These four would stand patiently in the front and when a order was done, they would quickly and carefully take it to the table needed. Two of our volunteers were busing tables. They would go around asking how the food was, welcoming people, taking trash away from tables, wiping them down when the costumers left, and running the dirty trays to the back where they could be washed. In all we had seven volunteers who very much enjoyed working this event. They were constantly walking around with smile and mingling with customers. In the end we know the event went very well. I would like to thank Culvers and my volunteers very much. Without you guys this would have never happened, it was a great partnership. I know that our volunteers had lots of fun delivering food and busing tables. We will definitely do this again! Donations totaled $108 and Culvers donated $103.69 totaling $211.69 but wait thanks to the June and Edward Lenz Charitable trust it doubles. This bring the night to a total of $423.38.